“because this customer account is designated as auto-pay you must specify an electronic payment method as the default”. Under the customer account, you will need to set the "Default Payment Method" field to the actual electronic payment method's ACH account (it will have the last 4 digits ofr the ACH account#). 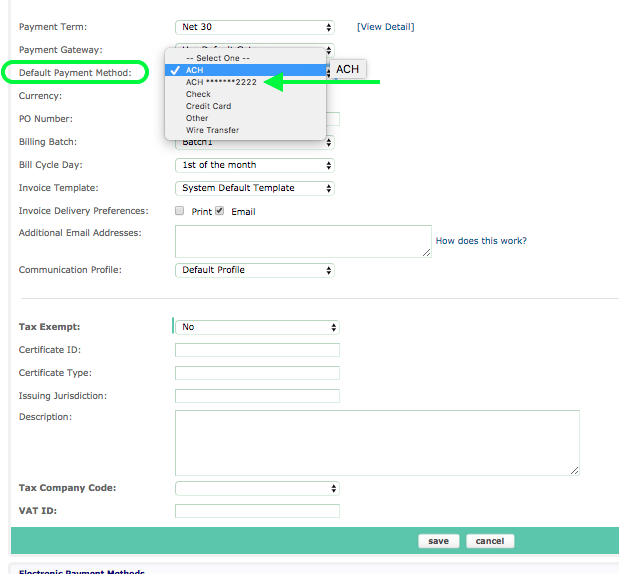 When you click on EDIT then open up the dropdown menu for this field, you will see the ACH payment method. This should take care of the popup message. It states: hpmCreditCardPaymentMethodId is optional but if you put in an ACH payment method id, the whole thing borks. Better to specify the payment method is as a SOAP call. It's an example of why the REST API isn't ready for prime time and why the SOAP API is still the safer place to go for implementations where the REST API isn't quite there yet. We raised it with support a while ago. From the UI perspective the guidance is clear. It's different for implementors and users of Zuora APIs. Namely choose your gateway, choose your electronic payment method. click save. Hey MikeMartin Is there a resoltion to the ACH payment method not working, or do you still need to use SOAP? My understanding was that the REST API was now complete and SOAP had been deprecated. We are running into the same issue! Using REST API we are trying to create a new account using ACH.